Along the bluffs of Lake Michigan lies the long-time home of the Milwaukee Brewers. 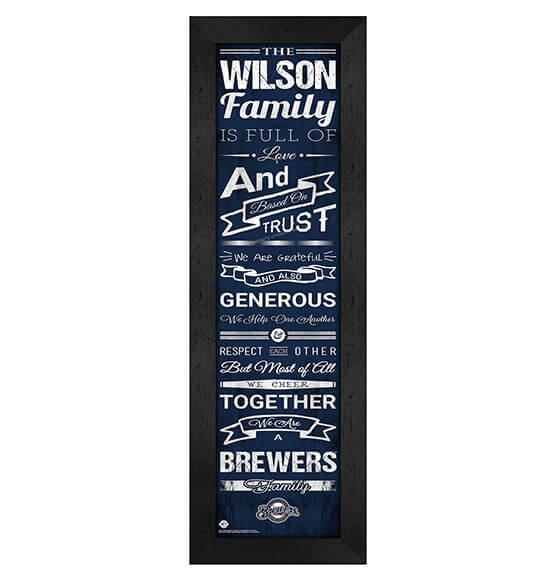 PersonalizedThings by Exposures offers this Personalized Family Cheer Milwaukee Brewers Wall Art in the team's vibrant colors. Customize this vertical-hanging, premium-quality print with your family name up to 12 characters for a special touch in a cherished home decor item. Included with a sawtooth hanger on its back for easy, fool-proof hanging, this print features sayings about family that will warm your heart. Whether it's hung in family rooms, living rooms or bar areas, this custom Milwaukee Brewers wall decor is sure to be a conversation starter!